Villa Katikies consists of seven units. 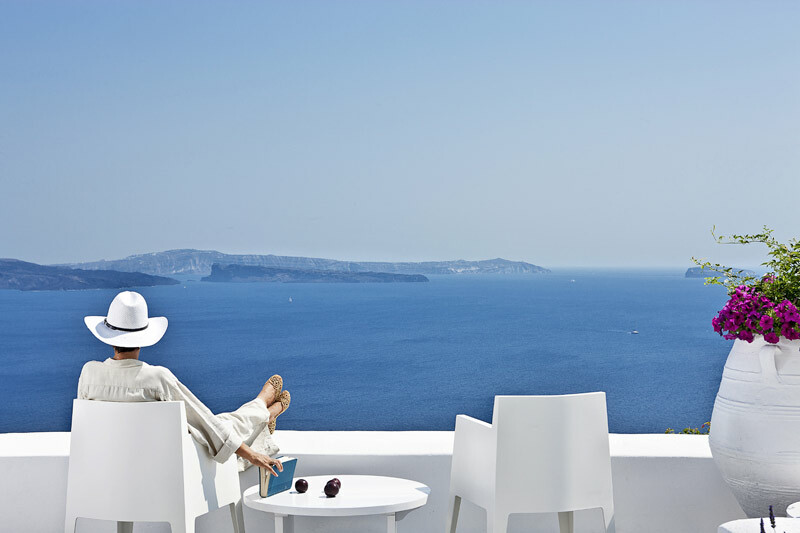 It is a member of SLH – Small Luxury Hotels & Club of Clubs, hanging from the cliff, 100 metres above the sea, at the charming and picturesque village of Oia. Oia is at the most westerly point of the island of Santorini. Villa Katikies is situated at the extreme north and away from the wild mass-tourism, offering guests a privileged spot to enjoy a unique atmosphere of romanticism and relaxation, and gorgeous views. The villa is conveniently located, only 30 min. away from Santorini international airport and Athinios port, 200 meters from Hotel Katikies. Villa Katikies - Villa Room: Bedroom, private veranda, all of them with sea view, bathroom with shower. Villa Katikies - Villa Suite: Bedroom, living room, private veranda, all of them with sea view, bathroom with shower. There is also a swimming pool and a sunbathing deck, a lounge bar with the nicest cooling drinks and cocktails and a light fare menu available to Villas residents. -Due to the particular construction of the villas ,for safety reasons ,children under 13 years old are not accepted.